The poet and writer Chris Desjardins created the Flesh Eaters in the heyday of L.A. punk scene of the late 1970s, enlisting many of his friends to be among the revolving roster in the band over a handful of albums. The most potent lineup was the one in 1981 that produced the band’s strongest album “A Minute to Pray, a Second to Die” that featured Dave Alvin and Bill Bateman of the Blasters, John Doe and D.J. Bonebrake of X as well as Steve Berlin of the Plugz, Blasters and Los Lobos. So enduring was that match of music with the poetry of Chris D., as he is known, that they were enticed to reunite occasionally for special events this century. That led to recording once more last spring for the album “I Used to Be Pretty” released on Yep Roc in January, and a tour that had its penultimate show Saturday at the Union Stage in D.C. It was quite a sight, this superstar lineup in a modest-sized basement club, from Alvin in his cowboy duds and Doe, solid in his bass rocking, to the behatted Bonebrake, largely handling the mallets on marimba and leaving the drums to Bateman. That light, jazzy touch from Bonebrake’s playing, mixed with Berlin’s improvisational sax, gave this a very different sound than what one might think of L.A. Punk from the days of the Masque, where the Flesh Eaters played alongside the Misfits, Dickies and Circle Jerks. While they packed the beat and attitude of the era, they could also groove along to solos from Alvin or Berlin. But it was all in service to Chris D., who with his bushy black eyebrows, stern profile and balding white pate, looked like Sam the Eagle from “The Muppet Show.” In his baritone and poetic point of view, he called to mind another L.A. rock poet from half a century back, Jim Morrison of the Doors, especially in longer songs that slowly built to explosive climaxes. The band was reunited in part to record songs they had played years earlier but never had a chance to lay down in a studio, and some of those were covers, from the Sonics’ “Cinderella” to the Gun Club’s “She’s Like Heroin to Me,” an anthem they saved for the two song encore. It was no faraway salute to the Gun Club and its leader Jeffrey Lee Pierce, who died in 1996; Desjardins was co-producer of the 1981 debut on which the song had appeared. While they could have been pursuing their main projects in bigger venues, the stars behind Desjardins seemed to be having fun, with Alvin broadly grinning as he plays the most basic riffs; Doe joining in on vocal choruses and thanking the audience between songs; and Bonebrake doing something quite different and melodic than the bashing he’s done for X. 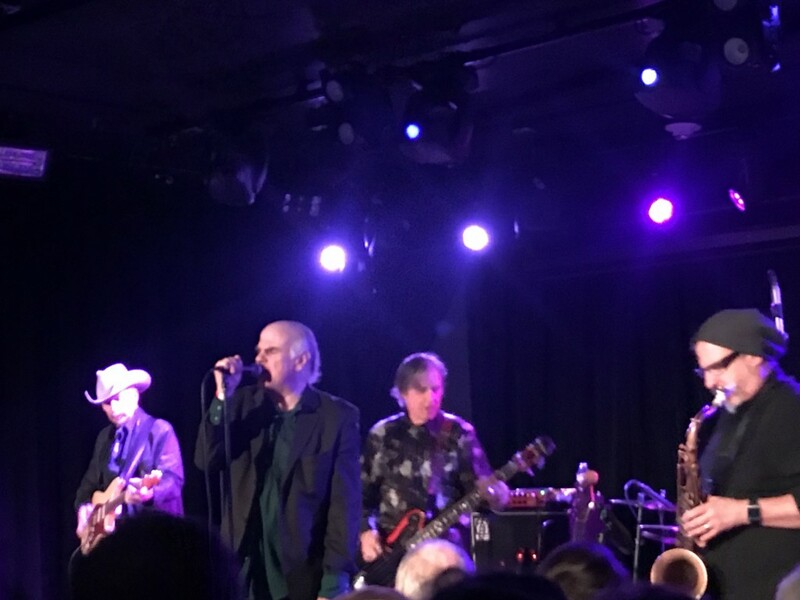 For the grey-bearded Berlin, it seems another gig where the cool and heat of his horn seemed to cut through whatever genre he was playing, as it’s been throughout his storied career from the Blasters to Los Lobos, with whom he continues to play. At its conclusion, Doe said they’d see you again soon, but didn’t elaborate whether it would be in this stellar incarnation.